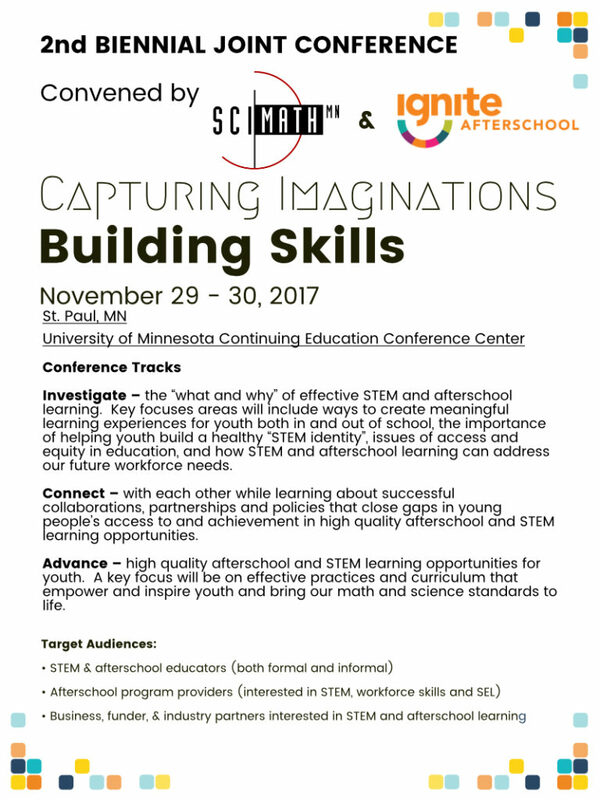 Please consider joining SciMathMN and Ignite Afterschool at our 2nd Biennial Joint Conference. This year the joint conference will be held at the University of Minnesota Continuing Education Center from November 29-30. Registration now open! The first 50 registrants will receive an Early Bird discount, so register today. Please consider submitting a session proposal. On Tuesday, April 18, Commissioner Cassellius hosted a public meeting to discuss where we are at in the process to develop the state Every Student Succeeds Act (ESSA) plan, what decisions have been made, and what needs to be done before submitting the plan in September. See the document outlining preliminary decisions that have been made. The Minnesota Department of Education also recently released information on the transition to ESSA and World’s Best Workforce in the 2017-18 school year. Minnesota is part of an event in support of evidence-based research in education and industry, pro-science programs, the health of citizens and the environment and quality science education. The march takes place on Earth Day, April 22, 2017 in Washington DC and around the country including 12 different sites in Minnesota. March for Science is a non-partisan, volunteer-based organization that is concerned by efforts to cut support to science, engineering, and higher education, issue gag orders against scientists, and continue to deny basic science as policy positions. The march has gained the endorsement of NSTA, MnSTA, SciMathMN and many science and STEM focused organizations. Details and updates are at this website (http://www.marchforsciencemn.com/) or Twitter @ScienceMarchMN. The Minnesota Science Teachers Association (MnSTA) strongly supports the concept that science must be a basic component in the daily curriculum of every elementary school student at every grade level. In the last decade, numerous reports have been published calling for reform in education. Each report has highlighted the importance of early experiences in science to allow students to develop lifelong curiosity for the natural world and problem-solving skills that empower them to participate in an increasingly scientific and technological world. In their recently released position statement on Elementary Science, MnSTA recommends that every elementary student in Minnesota should receive the equivalent of at least 3 hours of science instruction per week. See the full position statement. Lead by the growing aerospace industry Fly to the Future on STEM Pathways: Access-Innovation-Partnership aims to bring together representatives from business, K-12 educators, higher education, STEM program providers, and the government for a dialogue on working together to design and build a strong STEM pathway for students. The growing job opportunities in additive manufacturing, augmented reality, big data and analytics, cybersecurity, and other areas all require a strong base in the STEM disciplines. Beyond the academic grounding students also need interactions with practitioners, career awareness, and training opportunities. Keynote speakers for the forum include Dr. John Olson, Vice President and General Manager, Polaris Defense Strategic Advisor to Sierra Nevada Corporation and Dale Klapmeier, Co-Founder and CEO of Cirrus Aircraft and founding chair of Airspace Minnesota. The forum is convened by the Aerospace Industries Association in partnership with AirSpace Minnesota and the Aerospace States Association. Supporting organizations include the Minnesota High Tech Association, the American Institute of Aeronautics and Astronautics, and SciMathMN.